If you like tense combat, frantic chases through bleak landscapes, unique art styles, or all three, Betrayer should be worth a look for any horror fan who needs a fix between now and the release of Amnesia 2. Horror games are a genre that have gone through more peaks and valleys than most. Starting back arguably as far back as Haunted House on the 2600, this style of gameplay has adapted from the early 3D awkwardness of the original Resident Evil and Silent Hill, to the surge of over-the-shoulder Resident Evil 4 knockoffs during the PS2/GameCube era, to the recent adaptation of horror game tropes into new forms, such as the first-person exploration of Amnesia to the pseudo-16 bit stylings of indie titles like Jasper Byrne’s Lone Survivor. No matter the presentation, the gameplay trappings remain similar across most games of this ilk: sparse enemies that are far more powerful than you, a lack of readily available supplies, oppressive environments, and ambient sound design. 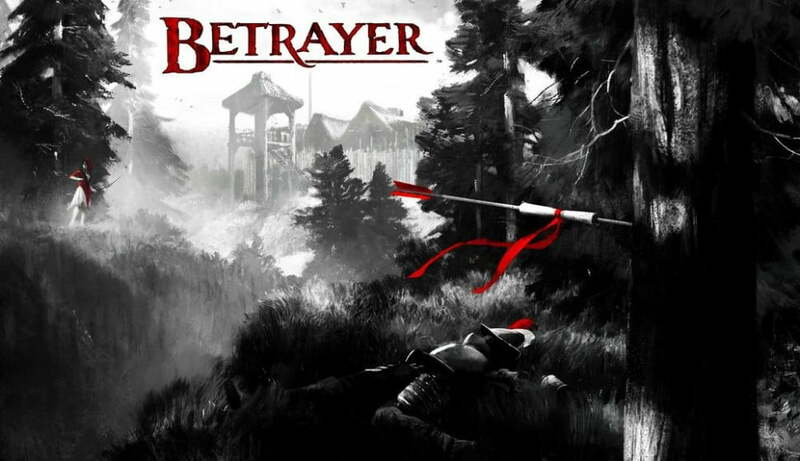 Despite the action-heavy pedigree of its development team, Blackpowder Games, the upcoming title Betrayer meets all of these criteria, and should prove worth a look for any fan of Amnesia or Call of Cthulhu. Betrayer is an upcoming PC exclusive available on Steam in Early Access, developed and published by Blackpowder Games, a newly formed studio consisting of many former creators of the cult-favorite spy FPS No One Lives Forever and the gun-fu-meets-Japanese-horror series F.E.A.R. Fittingly to both of those, it also utilizes a first-person perspective, although from a much slower and more deliberate pace than most other first person games. Betrayer is set in the lost early American colony of Roanoake. As a British citizen returning to the shores of the New World, it falls to you to explore the lost colony, find out what happened, and try not to have your soul swallowed. Gameplay, especially the combat, is particularly unforgiving, even by horror game standards. To heighten the tension, your combat options are kept limited: you have a bow and arrow, a weak melee attack, and a tomahawk…and that’s it. The enemies (called Conquistadors, and presented as shambling monsters clad in traditional Spanish armor) can pretty much always kill you in one hit, and unless you can fell them with arrows before they’re close enough to touch you, you’re done for. Helpful barrels of life-restoring water are spread throughout the world, although you’ll rarely find yourself walking away from a fight, let alone with low enough health to need to use the barrels. Luckily, the enemy AI is just aware enough to let you slip by unnoticed (although there was one instance of a Conquistador seeing me from clear across the map), if you’re more stealthy-minded. Death is handled pretty interestingly; a mysterious benefactor ‘patches up your wounds’ and helpfully drags you back to the nearest checkpoint, but is conveniently unable to carry any of your gathered money (because even abandoned colonies have shops), so you have to find the spot where you died to reclaim all of your coins, much like Demon’s/Dark Souls. A fast travel system exists to carry you between any previously discovered point on the map, and while the world isn’t nearly as big as Fallout or Saint’s Row or something, you still have plenty of path choices to get you from points A to B. The most striking thing about Betrayer is it’s art style. Everything is shrouded in a Sin City-style black/white veneer, with the occasional splash of color throughout – I know what you’re thinking, and it does look a little like MadWorld, but with more shades of grey and more subtle use of red. The lack of background music makes every twig snap and animal call harrowing, and while the quiet makes you more aware of the Conquistadors’ locations, it also makes it that much more tense when you can hear them near you. Vague notes strewn about the colony serve the same function as audiologs or diaries, helping to paint a picture of the lives these people led before…whatever it was that happened, and the desolate environments work closely with the striking art style to create a hostile, oppressive atmosphere. A strong sense of “you shouldn’t be here” is a hallmark of any successful horror game, and Betrayer absolutely nails it. As previously mentioned, Betrayer is currently available in a beta-esque Early Access mode on Steam as you read this, to allow for further gameplay balancing and bug fixes. If you like tense combat, frantic chases through bleak landscapes, unique art styles, or all three, Betrayer should be worth a look for any horror fan who needs a fix between now and the release of Amnesia 2.